In preparation for New Horizons’ flyby of its next Kuiper Belt target, 2014 MU69, the spacecraft’s team has conducted a series of ground, airborne, and space-based telescopic examinations of 2014 MU69 during a series of occultation events in June and July. The observation campaign has yielded tantalizing new information on the Kuiper Belt Object, revealing a potentially far more interesting world for New Horizons to explore on 1 January 2019. 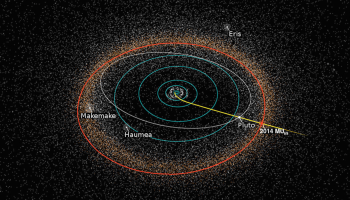 When New Horizons completed its historic flyby of dwarf planet Pluto on 14 July 2015, its team was already busy searching for its next potential flyby target in the Kuiper Belt – a region of icy bodies beyond the known major planets of the solar system. The science team quickly selected 2014 MU69 – originally known as 1110113Y – as the best target for New Horizons. In preparation for that flyby, the New Horizons team has undertaken a multi-occultation observation campaign from ground, air, and space-based telescopes to learn more about 2014 MU69. 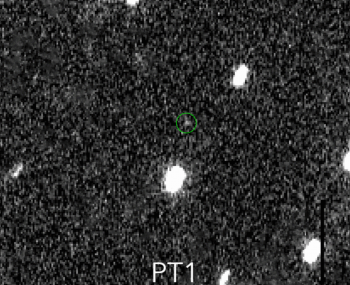 Over a six week period in June and July, the New Horizons team had the chance to gather critical encounter-planning information via a rare, three occultation look at 2014 MU69. For the 3 June stellar occultation, more than 50 team members and collaborators deployed along the projected occultation viewing path in Argentina and South Africa and aligned camera-equipped portable telescopes on the occultation star to watch for changes in the star’s light that would reveal information about 2014 MU69. The challenge for the observation team was that the occultation would only last two seconds and that uncertainties in 2014 MU69’s size and orbital position would make determine the exact ground track of the occultation highly difficult. Therefore, planning where to place the 50 telescopes was a challenge and success in actually seeing 2014 MU69 was not guaranteed. Therefore, the observation team had to make their best guesses on where to place the telescopes – with the hope that the shear number of telescopes across the path of the occultation would allow at least one to be in the perfect position to capture the full occultation while the others gathered valuable data on possible debris around 2014 MU69. Ultimately, the 50 telescopes observing the first occultation returned no direct images of 2014 MU69, but more than 100,000 images of the occultation star where captured, allowing an assessment of the environment around the object. “These data show that MU69 might not be as dark or as large as some expected,” said occultation team leader Marc Buie, a New Horizons science team member at the SwRI. Initial estimates of MU69’s diameter, based on data from the Hubble Space Telescope since 2014 MU69’s discovery in 2014, show a 12-25 mile (20-40 kilometer) range – though data from the first occultation event implied it is at or even below the smallest sizes expected. Besides MU69’s size, the first occultation results offer details on other aspects of the Kuiper Belt object. 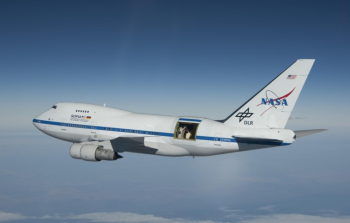 The following occultation on 10 July saw the observation team gain a new asset: NASA’s airborne Stratospheric Observatory for Infrared Astronomy (SOFIA) telescope. The 100-inch (2.5 meter) telescope on SOFIA provided the opportunity to gather improved measurements of 2014 MU69 and its surrounding neighborhood by flying into the very center of the occultation shadow based on new calculations of 2014 MU69’s size and position. Observations by SOFIA, coupled with ground-based viewings, not only helped the team better categorize 2014 MU69’s environment but also its size and reflectivity, which will enable New Horizons’ teams to properly calculate the exposure times of the spacecraft’s cameras and spectrometers for the flyby. 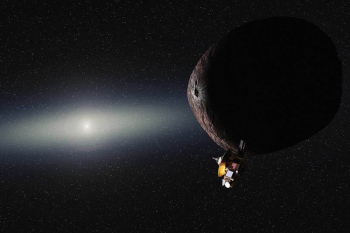 “We were only able to start planning the MU69 encounter after we flew by Pluto in 2015,” said Carly Howett, deputy principal investigator of New Horizons’ Ralph instrument. Regardless of the better understanding of the object’s size, again, no direct images of 2014 MU69 were obtained during the 10 July occultation – though SOFIA was able to probe the space around MU69 for debris that might present a hazard to New Horizons as it flies by. 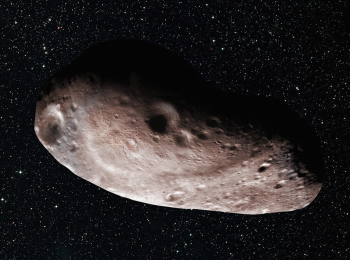 But the elusive Kuiper Belt Object couldn’t hide forever. For the third and final occultation event, the New Horizons team once again set up a picket line of 24 telescopes across Argentina as well as deployed the most prestigious telescope in their arsenal – the Hubble Space Telescope – to again better categorize the debris environment around 2014 MU69. Based on observational data from the 3 June and 10 July campaigns, the New Horizons team greatly increased their understanding of the precise orbital position of 2014 MU69 as well as its potential size – allowing them to refine the precise placement of the ground telescopes. The occultation would again be fleeting – with just a couple precious seconds available to capture the event. At 00:50 local time in Argentina on 17 July, several telescopes deployed by the New Horizons team were in precisely the right place at the right time to catch a glimpse of 2014 MU69 occult an unnamed star. In a matter of seconds, the New Horizons team captured new data on its elusive target and succeeded in seeing New Horizons’ next destination in what is considered the most ambitious and challenging ground occultation observation campaign in history. Speaking shortly after the event, “So far we have five confirmed occultations,” said Marc Buie. Moreover, the New Horizons team had strong support from Argentinian scientists, government officials, and locals who went above and beyond to ensure mission success. A major national highway was closed for two hours to keep car headlights away. Street lights were turned off to ensure absolute darkness. People parked trucks as wind breaks for the telescopes. “The local people were a major team player,” said Mr. Buie. 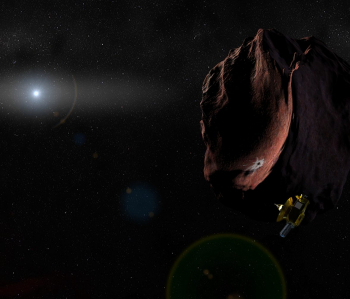 When New Horizons flies by, MU69 will be the most distant object ever explored by a spacecraft, over a billion miles farther from the sun than Pluto. 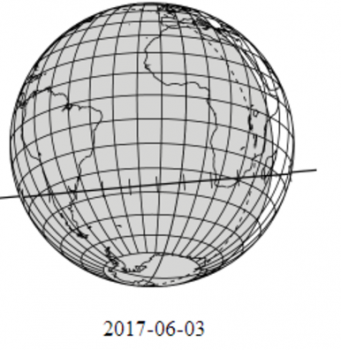 New data released from this summer’s three occultation campaigns reveal that 2014 MU69 might not be one object but two. New Horizons scientists are still sorting through all the data gathered from the direct observations taken during the 17 July occultation, but the preliminary analyses show that 2014 MU69 may not be not a lone spherical object but an “extreme prolate spheroid” (a skinny American football) or even a binary pair. The odd shape observed on 17 July has now prompted scientists to consider the possibility that 2014 MU69 is actually two bodies either orbiting very close together or even touching, known as a close or contact binary. Still more, the images could show a single body with a large chunk taken out of it. Importantly, the occultation events have allowed for a better determination of 2014 MU69’s size. It now appears the 2014 MU69 is no more than 20 miles (30 kilometers) long, or, if it’s a binary, each pair is about 9-12 miles (15-20 kilometers) in diameter.